From tranquil beaches and glass-bottomed boats to fire festivals and Ferrari Land, summer in Catalonia brings a wealth of experiences sure to delight families. Catalonia boasts 24 certified family tourism destinations, of which 19 can be found along the coastline. These form the Catalan Tourist Board's Family-Friendly beach holiday locations. Families in search of active holidays will find five certified Family-Friendly active holiday tourism destinations in the mountains and hinterland between the coast and the Pyrenees. Seven ski resorts are also certified, which offer activities both in winter and summer. Thanks to its scenery, culture, gastronomy and year-round sun, Catalonia has become an appealing destination for family travellers. Set one mile off the coast of L'Estartit in the heart of Costa Brava, the Medes Island Nature Reserve has seven islets covering over 50 acres and is one of the most important marine flora and fauna reserves in the western Mediterranean. The reserve is a popular scuba diving and snorkelling destination with diverse wildlife including eel, giant grouper, eagle rays, barracuda and even dolphins. In addition, families with small children who are less confident swimmers can take a journey on a glass-bottomed boat to experience the reserve's flora and fauna. Malgrat de Mar, Santa Susanna, Pineda de Mar and Calella are perfect family destinations for those looking to make the most of Catalonia's seaside activities. They offer all kinds of activities; from catamaran trips, water skiing classes and windsurfing to paddle boarding, surfing and kayaking amongst many more. The vast selection of activities on offer makes the beach the perfect venue for family water sports. In addition to incredible beaches, rivers, reservoirs and lakes, Catalonia is home to eight waterparks dotted along the coast. Aquopolis in Vila-seca is Catalonia's largest waterpark, where visitors can explore thrilling rides, swim with dolphins and enjoy more relaxed attractions aimed at younger children. Aquabrava waterpark in Roses is celebrating its 30th anniversary this year with the breathtaking new 'Cobra' ride, perfect for little daredevils. 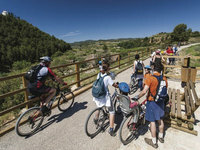 Catalonia has two main Greenways, spectacular family-friendly cycle routes along converted railway lines. These easily accessible and safe routes have minimal inclines and are perfect for children of all ages. The Terra Alta, Zafran Valley and Baix Ebre Greenway travels along 49 kilometers across 40 tunnels and viaducts, winding through the mountains, past streams and medieval mountain-top villages to Tortosa. The Girona Greenway covers 125 kilometers across four routes in Northern Catalonia, offering an excellent (and flat) way to explore the volcanic area of La Garrotxa and Costa Brava. Both routes offer an excellent, active way to explore Catalonia's diverse countryside, from the mountains to the Mediterranean coast. At Casa de l'Ós Bru dels Pirineus (House of the Brown Bears of the Pyreness) in Les Valls d'Àneu, families can learn about the region's famous brown bears, discovering what they eat and how to spot their tracks through audio-visuals, photographs and interactive games. Expert guides demonstrate tricks for recognising the signs of bears, which children can put to the test on one of the recommended hikes. Families can take advantage of the tranquil setting by picnicking in the nature reserve, embarking on family hikes and kayaking or canoeing on glacial lakes. Families can take an adventure tour which will guide them through the history of the famous l'Espluga caves. Audio visual projections, replicas of objects and real-life figures explain the history of these caves, which date back to Palaeolithic times. The adventure tour, which goes caving through the underground river, is available for children aged eight years and over. Family fun to blow you away! In 1887, Catalonian harvesters would don their straw hats, ride to the vineyards in a horse drawn cart and pick grapes in Mount Llopart. Today, visitors can learn about farming in the 19th century by experience it for themselves. Families can enjoy a horse cart ride before exploring the historic dry stone huts, crushing grapes by hand to make grape juice and enjoying a traditional farmer's lunch. This unforgettable harvesting adventure can be enjoyed between September and November all around the wineries of the Penedès region. As a destination, Catalonia offers many opportunities to get close to wildlife. Among these, none are as unique as the Tuna Tour in l'Ametlla de Mar. Located south of Tarragona, the Tuna Tour offers families the chance to learn from local experts about the history, fishing, feeding, research, biology and gastronomic value of bluefin tuna before diving in and snorkelling among hundreds of the giant fish. Children will love getting up close to these gentle and speedy giants. The story of tuna is an integral part of Catalan history and cuisine, and guests will also have the chance to sample local tuna as part of the tour. The world-famous PortAventura World Parks & Resorts has recently opened Ferrari Land, the only Ferrari theme park in Europe. Visitors can enjoy world class rides inspired by Ferrari, including the park's main attraction, 'The Vertical Accelerator', which sets a double record for being the highest and fastest rollercoaster in Europe. Ferrari Land joins a multitude of existing activities at PortAventura; music, shows, acrobatics and attractions for all ages including the highest freefall slide in Europe, three golf courses, a beach, a theme park and water park. From 10-18 June, families can celebrate the Patum de Berga Festival in Catalonia. Based on pagan rituals passed down through the generations, Patum includes a series of theatrical representations, characters and figures that fill the town of Berga with fire and dance. The specially cultivated Patum Infantile features days of activities related to the festival in which children perform at the Plaça de Sant Pere on Corpus Friday. Children can also learn about the history and traditions of the celebration at the Museu de la Patum. Taking place from 3-5 June, farmers from across Catalonia will hold open days to showcase their gardens, herds, workshops and fields, as well as providing unique insight into their production methods as part of the “Welcome to the Farm” initiative. Children will be delighted by the fresh meats and local cheeses, while parents can enjoy fine wine and cava. The initiative offers an exclusive opportunity to purchase the region's fresh produce directly from local producers and sample exclusive 'Welcome to the Farm' menus at a number of local restaurants. The initiative is sponsored by the Ferran Adrià's Alicia Foundation, a Catalonian research centre devoted to technological innovation in cuisine, the improvement of eating habits and the evaluation of food and gastronomic heritage. UNESCO World Heritage Site Tarragona is known for its spectacular Roman ruins, including its amphitheatre and aqueduct, set amidst the city's golden Mediterranean beaches. Each year, the international Festival of Roman History in late May brings the city's Roman past to life, offering visitors the opportunity to enjoy the port city's ancient monuments in an interactive way. Families can explore Roman times with activities including re-enactments of daily life, gladiator fights, artisan fairs, theatre performance and Roman food. For more information, visit catalunya.com.